The horizontal chemical peeler centrifuges were specially designed to meet the filtration requirements of the chemical and fine chemical industry. In this machine process system is separated from service system. All maintenance activities will be carried out in service area which can locate outside the clean room by installing the machine through the wall. We are providing Chemical Peeler Centrifuge which is developed employing the premium grade inputs and advanced technology. Our Horizontal Pharma Peeler is a batch type automatic / semi automatic filtering centrifuge. The axis of rotation of the basket in this centrifuge is horizontal. It is ideally suited for a clean room installation - “through the wall using a flexible membrane as required in pharmaceutical applications. 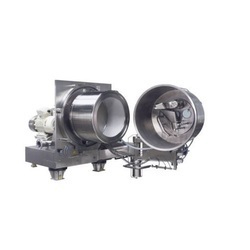 Peeler centrifuge operates on the principle of centrifugal force to separate solids from liquids by density difference.